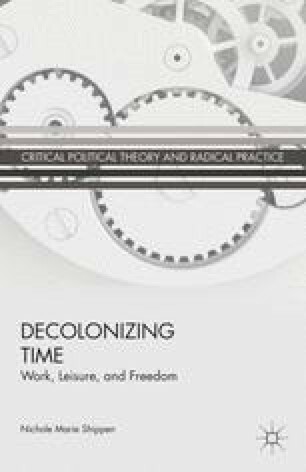 In the previous chapter, Lukács’s concept of reification was used to analyze the consciousness of time. More precisely, in modern capitalist society, time (a category of the mind) is treated as an autonomous force in its own right, thereby concealing its true nature as a category of political economy. This process greatly restricts the opportunity for developing deeper and alternative understandings of time beyond that readily provided by the consumer ethos and the culture industry. As a consequence of several historical developments, our ability to think critically about the political-economic factors that frame, structure, and limit “choice” around questions of leisure is significantly hindered if not stymied altogether. The assumption of leisure as freedom needs to be rethought in light of the dialectical relationship between production and consumption identified by Marx, whereby production shapes not only the objects for consumption, but also the subjects who ultimately complete the consumption process.1 Similarly, time spent in production shapes time outside of production in form and content, which is to say, the colonization of time by capital constrains not only the time available for the possibility of leisure, but also our imagination of alternative understandings of what we might want to do with and be in our leisure.